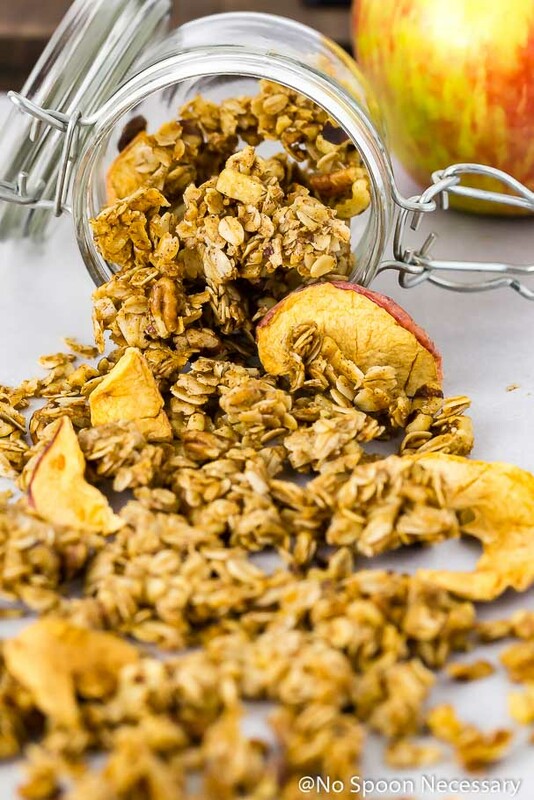 This Cinnamon Apple Pie Granola is crunchy yet tender with ginormous crispy clusters, notes of warm cinnamon, hints of spectacular apple pie spice and a sprinkling of dried apple chips. This granola is fabulously fall flavored and perfect for breakfast, dessert and every snack in between! Hey hey haaaaaaay, friends! What’s poppin’? <– Do people still say that? Wait did people EVER say that?  Hmmm… whatevs. I said it. So there. I also just said ‘whatevs’. You probably want to click on that X at the top of your screen now, huh? 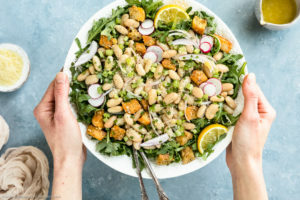 But, before we get to discussing today’s yummies for your tummies (<– I just can’t stop myself from being lame today), I have a small confession-y disclosure. Technically speaking: I have a confession that leads to a disclosure. I do not like pumpkin. Did your eyes just bug out of your head with shock and awe? Calm down. It’s not that serious. It’s not like I hate pumpkin or anything. I mean, I happen to love me some roasted pumpkin seeds. And I LIVE for butternut squash in the fall. I just don’t like pumpkin as a thing. I know I make no sense. Let me break it down. You will never see me order a ridiculously overpriced PSL. And I’m not gung-ho to stuff all the things with pumpkin flavor. And I detest pumpkin pie. So now you may be questioning all my life choices, but in reality you should be thanking me. 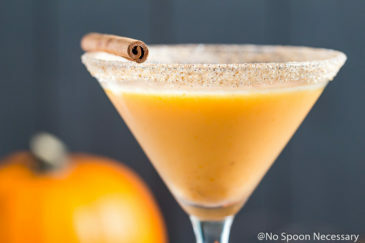 Because all this lack of pumpkin consumption over here at the SuBourbon Country Cottage just means more pumpkin for YOU. I’m about to blow your face up with apples. What I mean is, apples are about to be ALL up in your face. You can blame it on the lack of pumpkin. When you visit this little slice of the internet – you + me + apples – we are going to be a thang. An apple-y ménage à trois if you will. I’ll try to practice a little self-restraint and limit the apple flavored eats to every other post, but I make no promises. I AM blonde, so there is a strong possibility I will forget about all this talk of self-restraint. Phew. I feel better now that I got ALL that TRUTH off my chest. Let’s get to THE FIRST apple flavored eat of the fall season! Woot Woot! 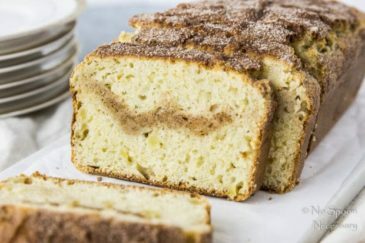 You guys if apple pie and granola had a baby and then a stork sprinkled it with cinnamon for good measure, THIS is what would have happened. 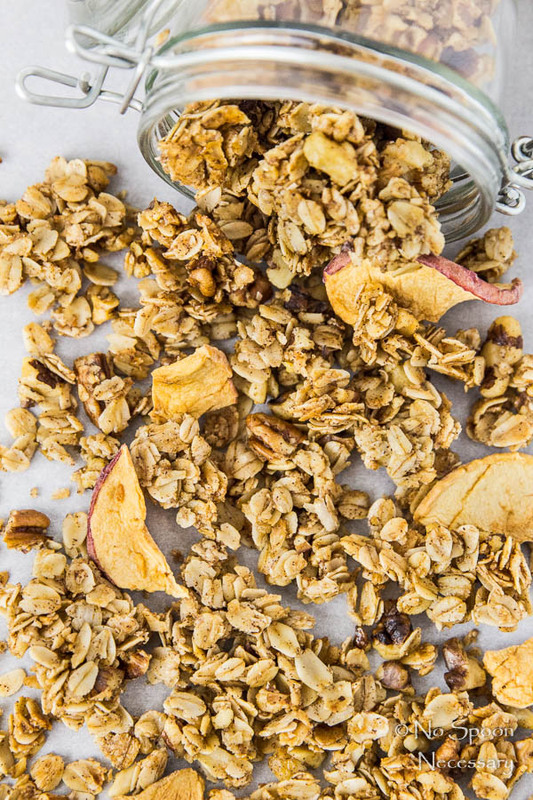 This granola is crunchy yet slightly tender and chewy with GINORMOUS crispy clusters, notes of warm cinnamon, hints of spectacular apple pie spice and a sprinkling of dried apple chips. This cinnamon apple pie granola isn’t overly sweet like candy, it is the perfect mix of sweet n’ savory.  fall flavored fabulousness up in here. 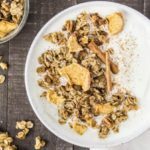 How to make granola from scratch? 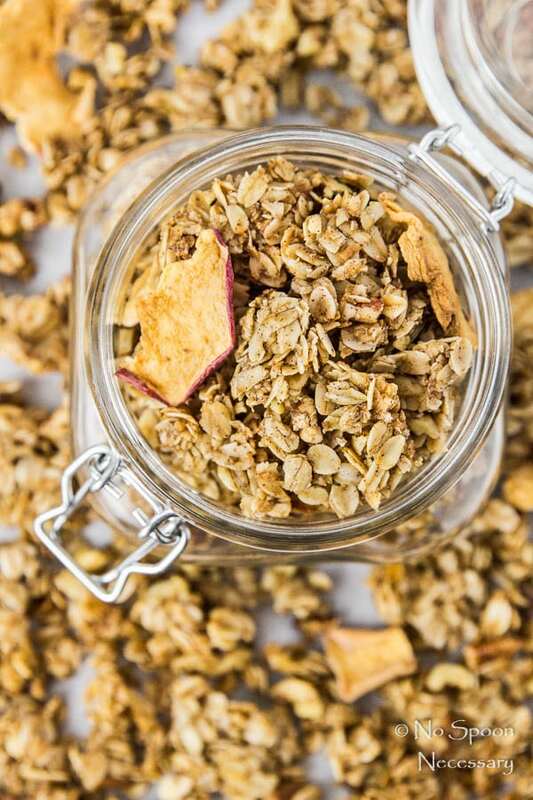 Homemade granola is simple to make! 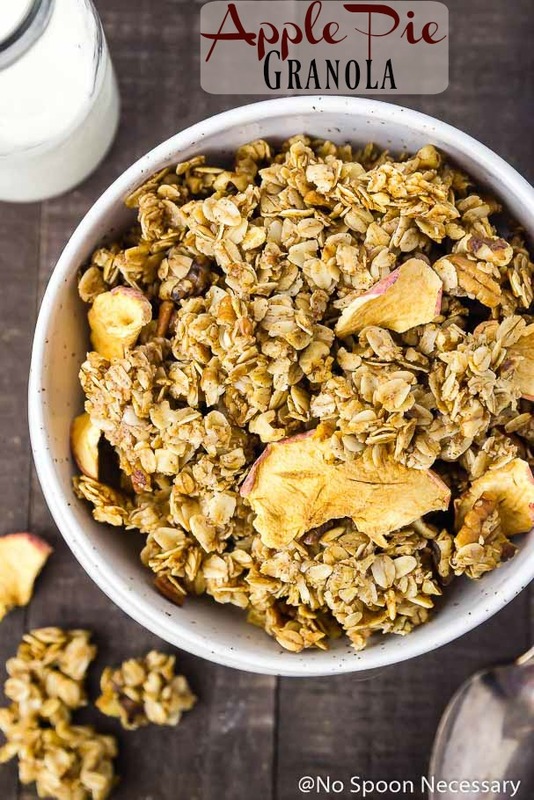 This easy apple pie granola only requires a handful of ingredients, such as rolled oats, sweetener, apple sauce, coconut oil, spices and dried nuts. 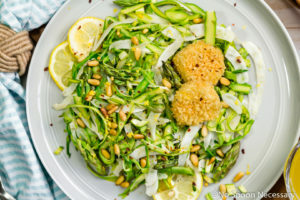 After collecting your ingredients, all you need to do is whisk together the sweetener, apple sauce, oil and spices and then toss in the oats and nuts. Next, you transfer the raw granola mixture to a sheet pan in an even layer, and bake, stirring once halfway through. Voila! Homemade apple pie granola! The above are just a few ways to use granola! 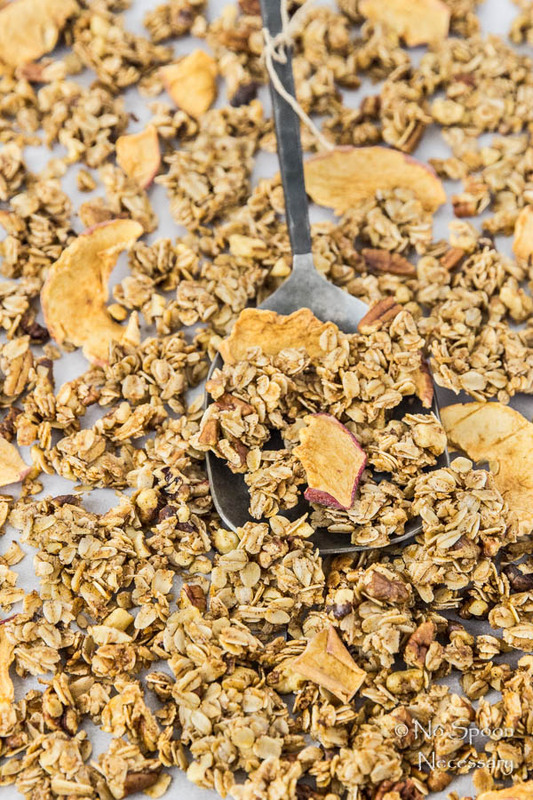 Honestly, granola is so versatile and more than just a quick snack on the go! How long does granola keep? 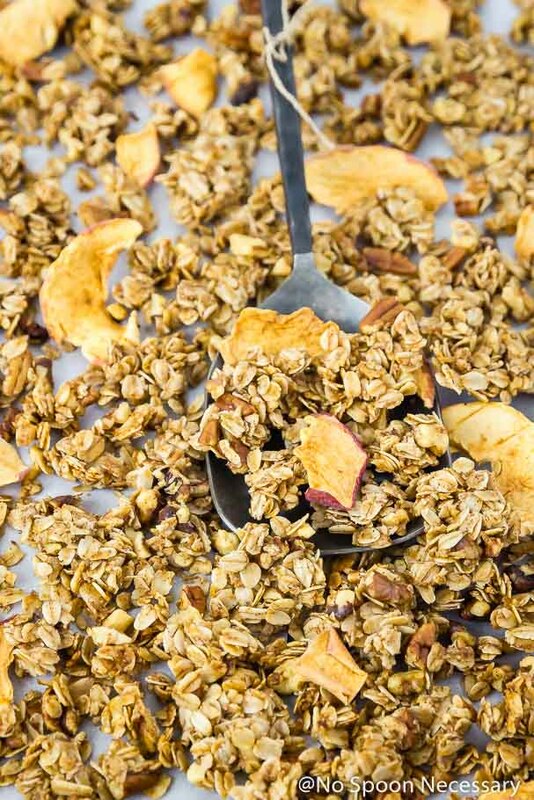 After baking, you should allow this easy apple pie granola to completely cool on the pan before transferring to a storage container. Homemade granola should be stored in an airtight container at room temperature. Properly stored cinnamon apple pie granola will keep for up to 1 week. 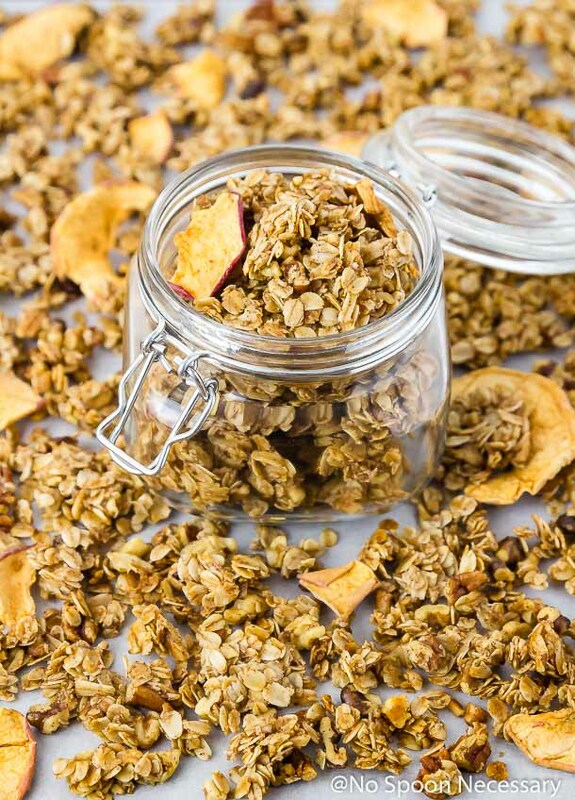 Alternatively, this DIY granola can be stored in the freezer for up to 2 months, just make sure you leave out the apple chips! 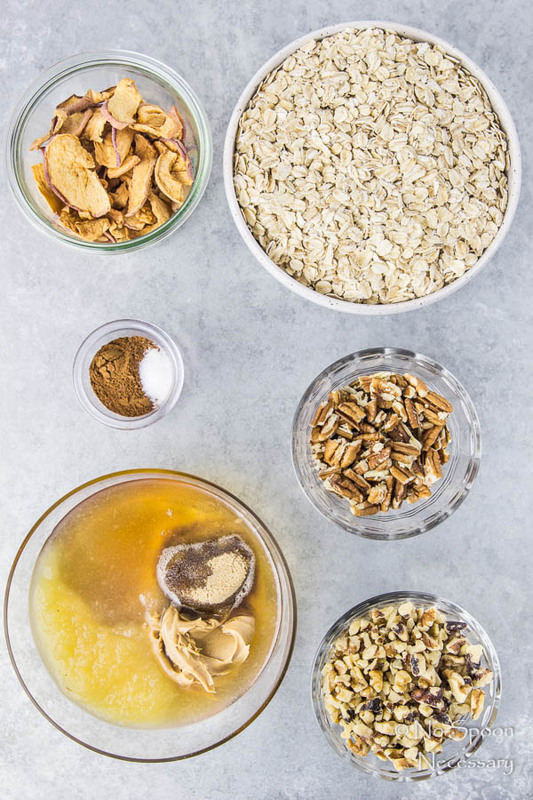 The homemade granola recipe below calls for walnuts and pecans, but you can use just walnuts, or just pecans, or you can substitute any nut you are a big fan of. Just make sure you are only roughly chopping the nuts. I use a zip-closure bag and a mallet, but you can use a cutting board and a knife. 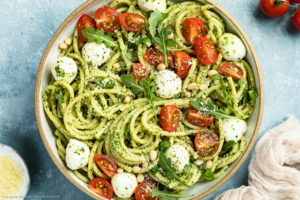 Just be careful if you use a food processor, you don’t want to over-process them into dust! The recipe calls for coconut oil and while you could substitute canola oil, I highly recommend you don’t. You CAN’T taste the coconut AT ALL, but the coconut oil helps make this granola gloriously clustery. Moral of this recipe note, use coconut oil. Speaking of clusters, the recipe below calls for 1/3 cup of honey. You can cut the honey down to 3 tablespoons, BUT you won’t end up with huge, delicious clusters of apple pie granola lovin’. Moral – use all the honey. When you remove the granola from the oven it will still feel a bit wet. Do not worry, it will harden and turn crunchy after it is allowed to cool on the pan for 15-20 minutes. DO NOT stir the granola when you remove it from the oven or you will prevent the large clusters from forming. You can find apple chips in the chip or nut isle of your grocery store. I found mine located with the specialty nuts and fruit chips. If you can’t find them or don’t want to use them, you can either make your own (bonus points if you have a dehydrator) or you can just leave them out. 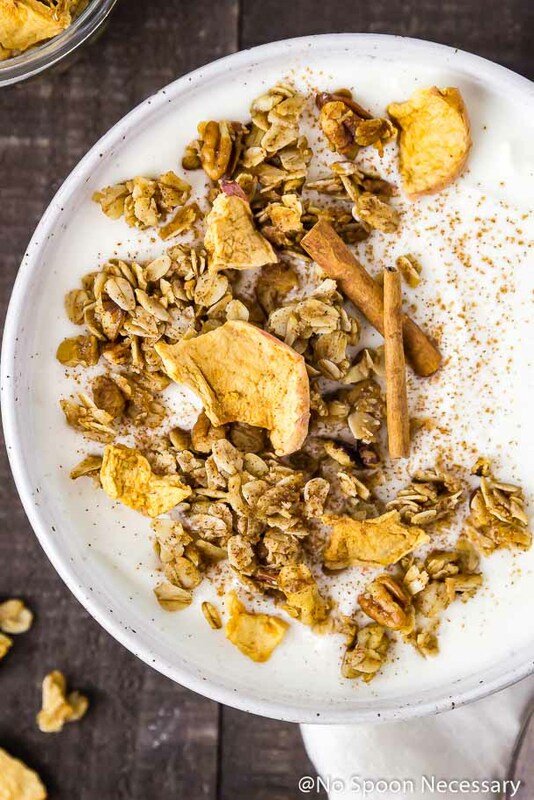 This granola tastes magical served on top of some honey flavored Greek yogurt, but it also tastes delish with a little milk poured on top. The granola will keep in an airtight container at room temperature for up to 5 days or you can freeze it for up to 2 moths… but it won’t last that long. Trust me. 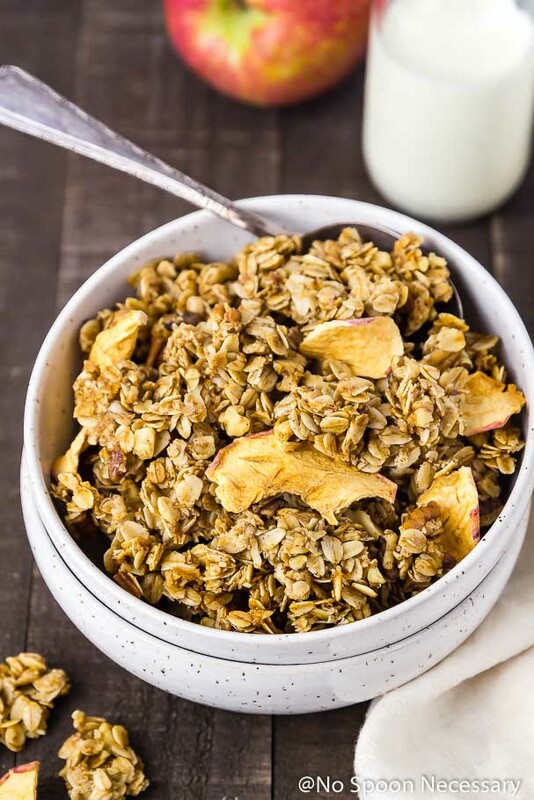 Cinnamon Apple Pie Granola recipe is perfect for breakfast, dessert and EVERY snack in between. Get your tookis in the kitchen and bake your fall granola dreams come true. 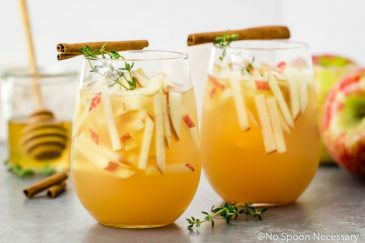 Until next week friends, cheers – to apples in ALL the things! 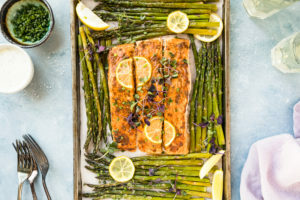 Preheat oven to 250 degrees F. Line a sheet pan with aluminum foil and spray with non-stick cooking spray. Set aside. In a small bowl whisk together the honey, brown sugar, maple syrup, apple sauce, oil, apple pie spice, cinnamon and salt. In a medium bowl, add the oats, walnuts and pecans. Stir in the honey mixture. 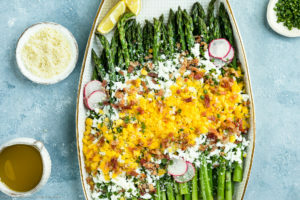 Transfer to a large baking sheet in a thin layer (use two pans if necessary). Bake in the oven for 1 hour, stirring once halfway through, or until granola is toasted and golden brown. Remove from oven and DO NOT stir. The granola will still feel wet. 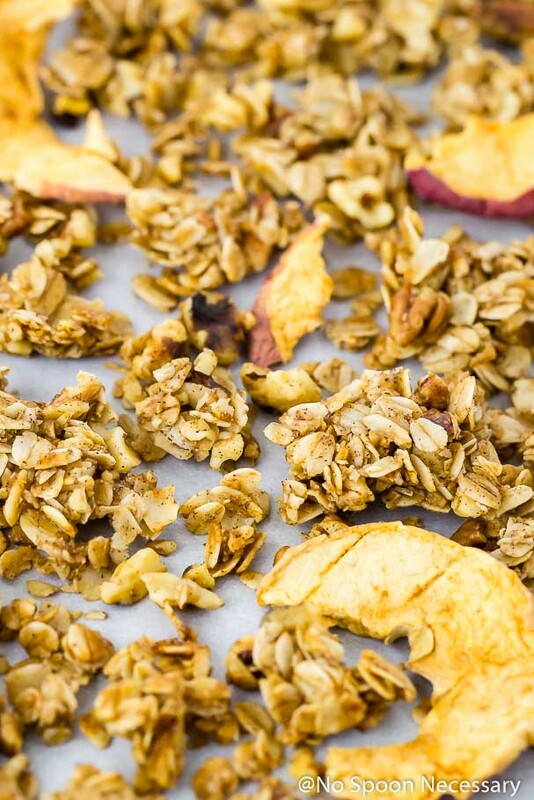 Allow granola to cool on the counter for 15-20 minutes. Add in the apple chips and toss to combine. *You can reduce the honey to as little as 3 TBS, but the granola will not be as clustery. *You can substitute canola oil for the coconut oil, but the granola will not be as clustery. *You can either leave apple chips whole or crush them, depending on preference. *You can freeze the granola for up to 2 months. This one snuck right by me. Great video! 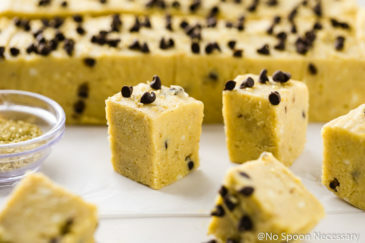 This looks so delicious, crumbly and perfect snack or addition to any yogurt or ice cream! Take care. 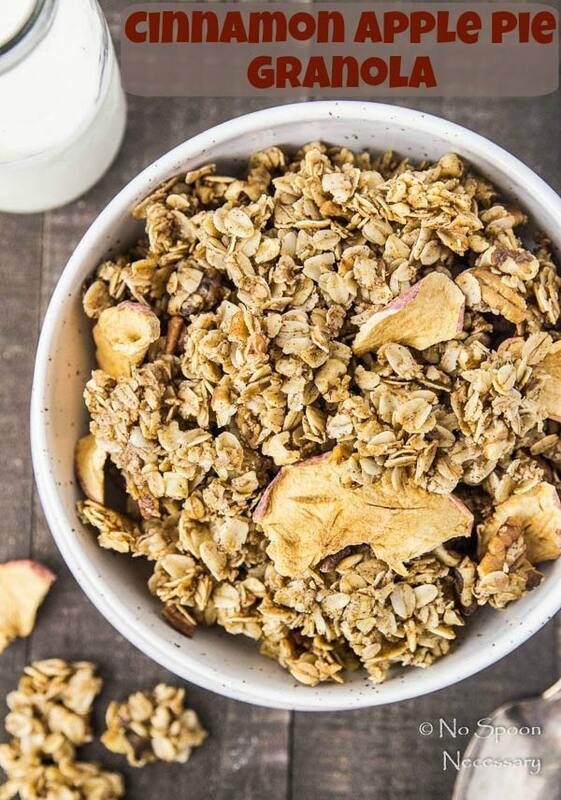 Your apple pie granola looks amazing! 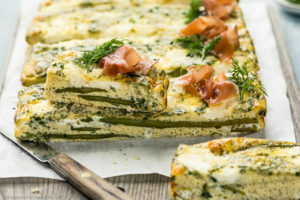 It would make a delicious topping for Greek yogurt in the morning.